The loop around String Lake gives you great vantages of this long, slender lake as well as the mountains that border it to the west. 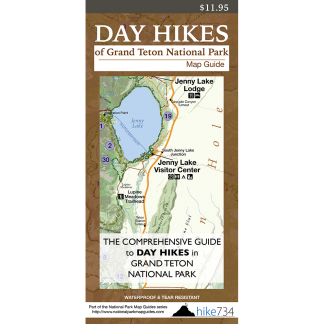 By doing this loop clockwise, the elevation going up along the mountains is more gradual, so at the parking lot take a left at the trail and follow it to the lake’s outlet. Cross the bridge over the creek then through the old burn area. Take a right onto the String Lake Loop Trail at the junction. The trail wraps around the lily pad covered south end of the lake then crosses a small inlet stream. You have wonderful views of the lake as you pass through a huge avalanche area at the foot of Mount Saint John. The trail gains elevation slowly and alternates between aspens and open avalanche chutes below Rockchuck Peak. The trail gets steeper as it enters a mature, evergreen forest. Take a right at the junction to stay on the String Lake Loop Trail where you steeply switchback down to a bridge at the outlet of Leigh Lake. After crossing the bridge, take a right to follow along the shoreline of String Lake on the partly paved trail. 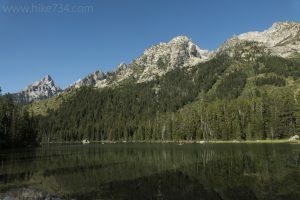 As you head back to where you started, there are continuous filtered views of the lake with frequent opportunities to step out and enjoy the picturesque, jagged peaks of the Tetons. Trailhead: Turn onto the road heading northwest at the North Jenny Lake Junction and turn right into the String Lake area. Park at the String Lake parking lot (or head up to the Leigh Lake parking lot to start and end from there).